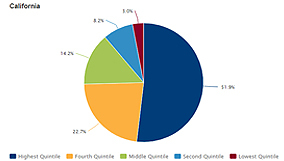 California’s highest earners receive 52% of all household income compared with 3% for the lowest household earners. While some income inequality is inherent in the economic structure of our society, extreme disparity reflects social and political choices. Read about our newly added measures on income inequality. Updated poverty data based on the federal poverty threshold, Supplemental Poverty Measure and California Poverty Measure are now available. 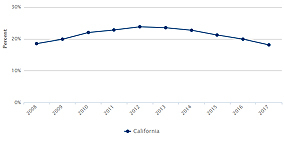 See how California children are faring. Stay up to date on all recently added and updated categories, topics, and breakouts on kidsdata.org all in one place. The demographic topic content now has 22 new indicators and 14 updated indicators. New indicators include sexual orientation and transgender youth. Updated indicators include births, child populations, and school enrollments. The educational environment is one of the core foundations that shape children and is crucial to ensuring optimal health and well being. Access over 270 indicators across more than a dozen topics from the viewpoint of California's students and school staff.